This Classical Revival style building has two stories with an asphalt shingle roof. It has been altered. The front has 7-bays with a center entrance. The building is wood frame with a hipped roof and hipped dormers, 1 on the Left ell and 2 on the Right. There is a large brick sidewall chimney on the Left side of the main house in front of the 2-story, 2-bay deep Left side ell. There is wood clapboard siding, dormers clad with wood shingles, and quoining on all the corners. There is a shallow entrance pavilion with pediment, modillions, and an oculus at the attic level. There is an in antis 2nd floor balcony with Ionic columns. The entrance portico extends from the pavilion with Doric columns, intact 8-over-12 windows (1st fl. ), 8-over-8 windows (2nd fl. ), and molded window headers. The long rear ell extends from Right rear corner and a full width rear porch connects to rear ell. There is “Lenox Community Center” lettering in the frieze. LANDSCAPE: there is a semi-circular drive in front yard centered on the front entrance. 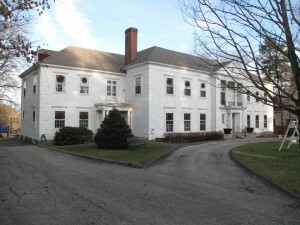 Although built as a clubhouse for the Lenox Brotherhood Club, this building was designed to resemble a large country house, similar in scale and ornament to its Walker Street neighbors. The use of Classical Revival style, popular for civic buildings such as the Town Hall (1901), was a way to have the new building reflect the historic character of Lenox. The Lenox Club occupied a building on this site until 1921, when it moved to its present location at “Windyside” on Yokun Street. The old Clubhouse was purchased by George E. Turnure, who then built a new community center in memory of his son who had been killed in the First World War. This new community center became the home of the Lenox Brotherhood Club, an organization made up of the union of the Men’s clubs of the Episcopal and Congregational Churches. The community center provided recreational facilities such as a tennis court, billiard room, gymnasium, and bowling alley. The center also has a large hall and stage. Membership in the club expanded in the 1930’s and eventually became open to all. It is currently owned by the Town of Lenox, and provides programs for the community such as the Council on Aging for seniors, youth programs, fitness classes, and meeting space.